As a political outsider, radio launched Dan Patrick's career. But now that he's mostly off the airwaves and in the lieutenant governor's seat, Patrick's station continues to push his conservative agenda. Lt. Gov. Dan Patrick's voice has largely left the airwaves of KSEV-700 AM. But he still owns the radio station that launched his political profile, and it's helping him maintain power. On Nov. 4, 2014, a flamboyant two-term state senator from Houston and conservative radio show host was poised to become the state’s lieutenant governor-elect, with early election results showing Dan Patrick ahead of his Democratic challenger by nearly 20 points. More than 300 supporters had gathered at the Norris Conference Center in Houston to watch the populist firebrand claim victory, but before addressing the eager crowd, Patrick stole a moment to acknowledge those who had tuned in to his message even before he set his sights on Austin. Sneaking off into a quiet corner, the Houston Republican recorded a special message for his radio fans. “I just want to say thank you to the KSEV listeners. I would not be here on the threshold of becoming the next lieutenant governor without you,” Patrick said in the recorded video, as a sweet jazz piano tune played in the background. “When we ran for the Senate, everyone said, ‘Dan doesn’t have a chance. He’s just a radio guy.’"
In a sense, Patrick was signing off. Even as a senator, he continued hosting the drive-time talk show that launched his political career. Stepping into statewide office, however, would force Patrick to hand over the reins to others. But Patrick, who declined to be interviewed for this story, didn’t fully leave behind his small radio empire. Three years later, he still owns KSEV-700 AM, “The Voice of Texas.” And even if his voice is rarely heard on those airwaves, the station continues to push Patrick’s agenda — no longer the priorities of a political outsider, but rather one of the state’s most powerful politicians. With some of Patrick’s friends calling in to programs or hosting them, KSEV rallies its listeners around his efforts to slash property taxes, regulate bathroom use for transgender Texans and beef up immigration laws. And it keeps diehard fans fuming against Patrick’s foes, whether they're Democrats or House Speaker Joe Straus, a more moderate Republican who has largely resisted Patrick's social agenda. “You’re getting it straight from the horse’s mouth — what’s happening in Austin. That, I think, continues to attract people to the station,” said Jared Woodfill, a lawyer, former chairman of the Harris County GOP and an occasional guest on KSEV programs. During most broadcast hours, the station’s content fits the mold of a typical AM talk radio station in Texas. KSEV broadcasts syndicated programs by conservatives with huge national followings such as Laura Ingraham. Weekday hours are mostly devoted to self-help shows, including "The Lifestyles Unlimited Real Estate Investor Radio Show," which promises to turn any literate Texan into a house-flipping millionaire, and the "Houston Methodist Health Hour," hosted by urologist David Mobley, who fields callers’ questions on everything from erectile dysfunction to lower back pain. Every so often, Patrick will record ads for local businesses, encouraging people to buy from his friend Vinnie Tortorella at Muscle Cars of Texas, or touting the services of real estate agents Ronnie and Cathy Matthews (who have donated at least $11,000 to Patrick’s campaign). Randall "Buck" Wood, a longtime ethics attorney in Austin and a Democrat, said such advertisements would not run afoul of any state ethics laws, so long as KSEV properly charged donors for air time. Lt. Gov. Dan Patrick voices an ad for Houston-based Ability Tree Experts, which recently aired on his radio station, KSEV-700 AM. Then there are the drive-time political shows, which resonate with the Tea Party branch of the Republican tree. 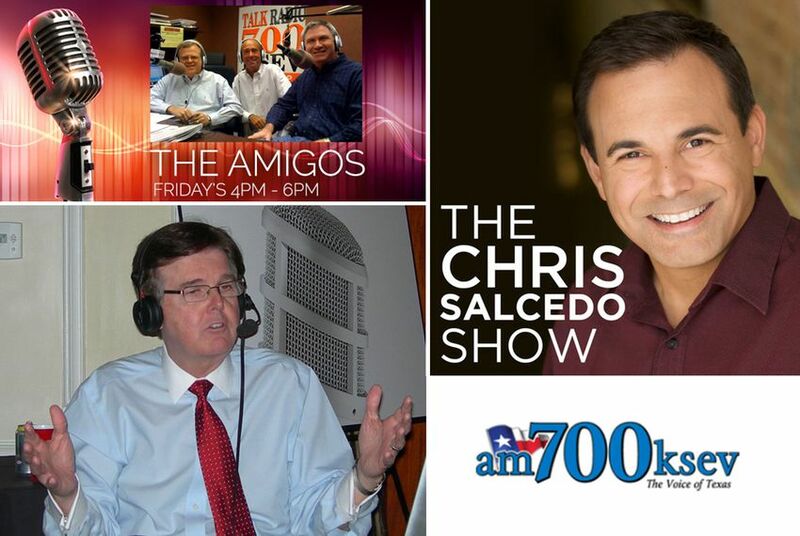 Mondays through Thursdays, there’s Dallas-based syndicated host Chris Salcedo, the “liberty-loving Latino,” whose chief target is Straus, the House speaker. On Fridays, Texas Sen. Paul Bettencourt, a Houston Republican and one of Patrick’s closest allies, hosts a show called “The Amigos,” featuring three friends who frequently wax on about how much more conservative the Texas Senate is than the House. When it comes to Nielsen audience ratings, KSEV ranks third among news/talk stations in the Houston-Galveston region, but ratings aren't the best measure of the station's political value, its followers say. At the peak of the 2017 political season, as lawmakers prepared to reconvene in an overtime session, KSEV cranked up the volume on its anti-Straus messaging. It was the afternoon of June 16, about two weeks after the end of the regular legislative session, and Bettencourt sat behind a microphone in the nondescript northwest Houston office building that houses KSEV. He turned a caller’s question about obstruction in Washington into a commentary on Texas politics. “Right now, I’m trying to pass property tax relief. We’ve got — the Senate supports property tax relief. The lieutenant governor, Dan Patrick, is for property tax relief. Speaker Straus is obviously not for it,” Bettencourt said while hosting “The Amigos” alongside Ben Streusand, a Houston businessman and a onetime Tea Party candidate for the U.S. House, and Eric Andell, a former judge and the station’s sole liberal voice. Bettencourt goes by the “Tax Man" on the show and often references his quest to lower property taxes. In advertisements for his tax firm, Bettencourt encourages KSEV listeners to protest their property taxes and to seek out his services for better results. At the Capitol, he and Patrick have pushed legislation that would make it harder for local governments to raise property taxes. Chris Salcedo interviews Texas Sen. Paul Bettencourt, a Houston Republican and fellow KSEV radio personality, on March 31, 2017. Bettencourt praises the work of his Senate colleagues, led by Lt. Gov. Dan Patrick. Patrick and Straus, already rivals going into 2017, ratcheted up the ill will between their chambers as they squabbled over high-profile issues throughout the legislative session. The leaders have held dueling press conferences, and each has accused the other of forcing Gov. Greg Abbott to call the special legislative session that kicked off last week. They’ve fought over education financing. Patrick, unlike Straus, wanted to spend taxpayer money for private school tuition and, ahead of the special session, likened Straus’ school finance plan — which sought to add $1.5 billion in state funds for public education — to a Ponzi scheme that would lead to a statewide income tax. They’ve fought over bathroom use. Patrick, branding his effort a “privacy bill,” wants to require Texans to use restrooms and locker rooms corresponding with the gender listed on their birth certificate. Straus views the policy as a solution in search of a problem, with the potential to scare away businesses who view the proposal an attack on transgender people. On air and using social media, KSEV offers a running commentary on these battles. Straus' office declined to comment for this article. During the June 16 episode of “The Amigos,” Bettencourt referenced comments Straus made at a Texas Association of School Boards gathering — deriding Patrick’s bathroom proposal and likening such policies to “manure.” Straus also said some of the educators would make great state senators. This didn’t sit well with Bettencourt, who declined to be interviewed for this article. “For the first time that anybody’s aware of in the House or Senate, we have a legislative leader going around asking people to run for the other chamber’s position because obviously you don’t like the public policy position,” Bettencourt said. Salcedo's blistering attacks aren't limited to Straus. Less than two months earlier, Salcedo used his microphone to hammer Democrats trying to resist Patrick’s agenda and blasted state Rep. Victoria Neave, D-Dallas, for staging a hunger strike in protest of Senate Bill 4, the crackdown on "sanctuary" jurisdictions that Abbott ultimately signed into law. Chris Salcedo criticizes state Rep. Victoria Neave, D-Dallas, over her hunger strike to protest Senate Bill 4, the Legislature’s crackdown on “sanctuary cities.” The segment aired on KSEV on April 24, 2017. Before Salcedo and Bettencourt, Patrick's voice filled the rush-hour slot. It was the last leg of a decades-long journey on the air that included jobs as a sportscaster, reporter and talk show host. He had a knack for attention-grabbing stunts. He once took off his shirt, donned a blue cowboy hat and had two women paint his torso in a show of support for the Houston Oilers. As a radio reporter, he once underwent a vasectomy on the air. Patrick nabbed his first radio gig as an 18-year-old in 1968, according to his campaign materials, and after college, beginning in 1977, he spent eight years as a sportscaster on television — a career that brought him to Houston’s KHOU, where he became one of city’s most popular TV personalities. Patrick also dabbled in business. In the early 1980s, Patrick teamed up with several investors to open up Dan and Nick’s Sports Market, one of the nation’s first sports bars, according to a 2007 Texas Monthly profile of Patrick. Soon, the investors expanded their franchise, building a total of five bars in fast-growing Houston, which was flush with cash during an oil boom. But bust followed boom, ravaging Houston's economy, and Patrick was forced to close several bars. At age 36, he declared bankruptcy, and a crowd of angry creditors and lawyers dogged him for years. Trying to turn his luck around, Patrick bought a block of time at a small radio station in Tomball: KSEV. He built a radio studio in his surviving bar and started a sports talk show, selling ads himself to scrape by, according to the Texas Monthly profile. Patrick arrived at KSEV just in time to take advantage of its legal strife — and ultimately take it over. Its owner, a podiatrist, faced a lawsuit from shareholders, and Patrick offered him a way out. Patrick persuaded the owner to sell him the station for its remaining debt and talked the shareholders into ending their lawsuit for a cut of the station’s earnings. By 1988, Patrick ran the place. Shortly after, a little-known right-wing commentator contacted Patrick about getting some air time. Patrick agreed, and the commentator, Rush Limbaugh, quickly exploded in popularity. So did Patrick, who turned the focus of his talk show from sports to politics. Fashioning himself as a populist, Patrick took aim at establishment figures in Houston and Austin and preached his view of fiscal conservatism and Christian values. By most accounts, the seeds of Patrick’s political future were planted in 2003 at a hearing about property taxes at the Texas Capitol. Patrick had traveled to Austin with a band of supporters who wanted to cap the amount property appraisals could rise at 3 percent per year, down from a maximum of 10 percent. He found an unfriendly audience at the Capitol, where prominent House Republicans opposed lowering the cap, believing it would starve local governments of necessary funds. The day ended with Patrick shouting at lawmakers and a state trooper being called in to restore order. A few years later, with the encouragement of his radio supporters, Patrick ran for a Senate seat in 2006 and won easily on a promise to curb property tax growth. Patrick continued to broadcast throughout his Senate tenure, leading to cold treatment from some lawmakers, who viewed him as a novelty or showboat. But, at least early in his legislative career, Patrick’s radio pulpit also instilled fear. With the help of his radio fans, Patrick continued to win elections and grow his profile in Austin. By 2010, he formed a Tea Party Caucus in the Legislature. By 2012, he chaired the Senate Education Committee. Now, as lieutenant governor, some see Patrick as the most powerful politician in Texas. He’s hardly the first politician to use radio as a springboard. Vice President Mike Pence and former Texas Gov. 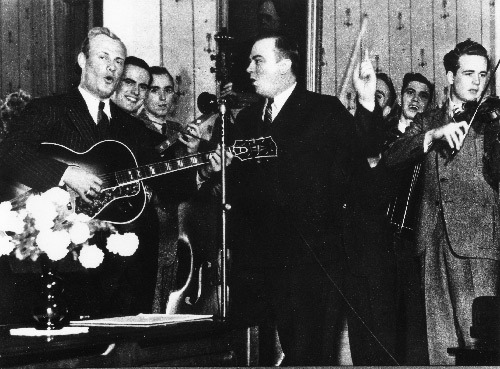 Wilbert Lee “Pappy” O’Daniel — a populist who promoted Hillbilly brand flour and the Ten Commandments on air during the 1930s — both used radio to help kick-start their political careers. And former President Ronald Reagan — "The Great Communicator" — rode his acting and broadcast talents into the California governor's mansion before earning two terms in the Oval Office. Those figures, however, didn’t continue to own radio stations after winning office. These days, Patrick doesn’t have much time to hang around the studio, according to current and former workers and his official calendar. When he does stop by, colleagues greet him with a “hello stranger,” his spokeswoman says. But with Bettencourt — the successor to both Patrick’s Senate seat and his Friday radio spot — filling that prime slice of drive time, Patrick doesn’t need his own mic to put his agenda into the ears of KSEV’s listeners, who one one former producer called mostly white, male and suburban. Andell, the liberal voice on “The Amigos,” was one of several current or former station employees who said Patrick did not dictate any of the show’s content. But by tapping on-air personalities who share the lieutenant governor’s politics, Andell said, Patrick doesn’t need to give orders to get his message out. “I should be so lucky to plan to run for public office and have a radio station at my disposal,” Andell said. Whether he’s appearing on his own station or another, Patrick is still using radio to move the Republican Party closer to what he envisions. This was apparent on Sept. 19, 2016, when the presidential election was in full swing. Patrick went on Ingraham’s show — broadcast to KSEV listeners and to conservatives across the country — to pressure U.S. Sen. Ted Cruz to endorse the Republican nominee, Donald Trump. Patrick had until that moment been a staunch supporter of Cruz. But, speaking to Ingraham, he gave Cruz some advice — or, perhaps, a threat. Within a few days, Cruz had endorsed Trump.